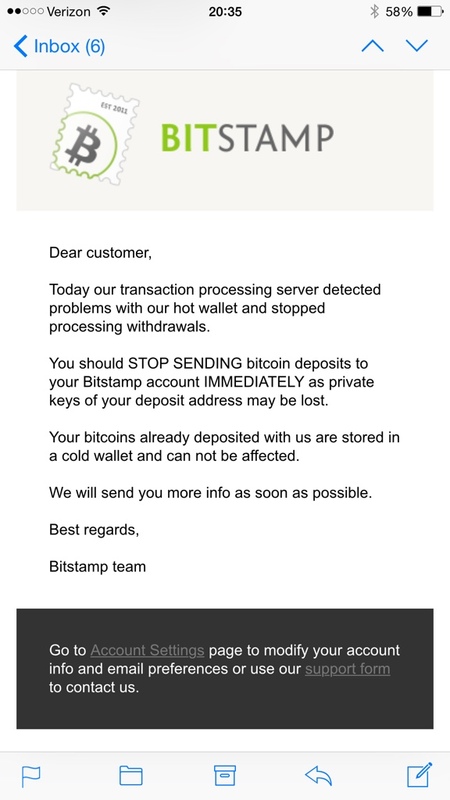 Bitstamp sent out an email Sunday, telling users to stop depositing bitcoins at the exchange. Money that is already deposited at the exchange is safe. The cold wallet is not suffering from the same issue, according to the email. The Slovenia-based exchange is currently one of the largest Bitcoin exchanges, alongside BTC-e, Coinbase, and others. Last year the exchange went offline temporarily because of DDoS attacks that affected the network. Exchanges help users swap USD and other currencies for Bitcoin. Bitcoin has had a rocky start to 2015. The price dipped well below $300 over the weekend and many news outlets have declared it ‘dead’ for the 23rd time. Cointelegraph will update with more information as it becomes available.